Jimi’s father, Al Hendrix, won bitterly fought estate litigation in the seventies, but the trademark litigation has never stopped. Multiple injunctions are in place under the corporate name, Experience Hendrix, LLC, but the infringements just keep coming. Companies keep popping up to sell Jimi Hendrix branded goods. Andrew Pitsicalis and Leon Hendrix are frequently involved. Their latest attempts to profit from the Jimi brand include marijuana related products (apparently “Purple Haze” has long been a well know strain of cannabis. See: Legal Battle Ensues Over Jimi Hendrix Usage Rights (High Times, 3/29/17); Jimi Hendrix’s heirs wage court battle over branded cannabis, other products (Cannifornan, 3/22/17). Ah! But Are You Experienced? Not necessarily stoned, but beautiful. Jimi’s brother, Leon Hendrix (shown right), is an artist and musician himself with his own following. Some think he was treated unfairly by his Dad and Step-Sister. For a variety of reasons, especially I suspect the impact of Pitsicalis, the CEO of “Purple Haze Properties” and Leon’s business partner, there is still bad blood. Chris Fry, Jimi Hendrix’s Brother Fires Back Against Estate (Courthouse News, 3/28/17). Well, the night I was born. Lord I swear the moon turned a fire red. The night I was born I swear the moon turned a fire red. Well my poor mother cried out “lord, the gypsy was right!” And I seen her, fell down right dead. Have mercy. Spoliation sanctions generally arise from a haze, just not a stoned purple haze, more like an angry moon turned a fire red haze. Even a seasoned District Court Judge in the SDNY, Paul Engelmayer, was “dismayed” by the conduct of Pitsicalis and Leon Hendrix. Well, what did you expect in matters involving the Estate of a Voodoo Child musical genius? The best guitarist that ever lived? As the docket in this matter reflects, the Court has been called upon dismayingly often to act when presented with evidence of the PHP defendants’ persistent non-compliance with basic discovery obligations. Plaintiffs now move this Court to sanction these defendants for (1) spoliation of evidence and, more generally, (2) “consistent, pervasive[,] and relentless discovery abuses by [d]efendants and their counsel, Thomas Osinski.” Dkt. 245. Plaintiffs request, inter alia, a preliminary injunction, an order of attachment, an adverse inference instruction at trial, and terminating sanctions. See Dkts. 237, 244. For the reasons below, the Court grants the motion for an adverse inference instruction and directs the PHP defendants to pay the reasonable fees and costs incurred by plaintiffs in bringing this motion. Experience Hendrix, LLC v. Pitsicalis, No. 17-cv-1927 (PAE) (S.D.N.Y., 11/27/18). Expressing “dismay” is about as emotional as Judge Engelmayer gets in writing an opinion, even one sanctioning a party for destroying evidence and disobeying court orders. The PHP defendants mentioned are Leon Hendrix, Andrew Pitsicalis and their corporation, Purple Haze Properties (PHP). As you can see from the first quote, the attorney who represents them, Thomas Osinski, was also accused of discovery abuse. That often happens in joker and the thief type cases like this. PHP Defendants’ Failure to Produce Forensic Images as Ordered. Apparent intentional disobedience of court orders to make forensic copies of and produce certain drives, even after daily fines are imposed for late production. One of the excuses PHP offered was especially humorous, especially considering the NYC venue, but they actually claimed “that they had had difficulty hiring an expert technician who could image the hard drives.” Yeah, it’s real hard. Need I say more about Osinski’s veracity? When they finally did produce some, but not all of the forensic images, they were not “forensic” images. They were just copies of all active files (a “ghost” copy) with no forensic copy of the slack space. That is what a forensic copy means. It allows for search and examination of deleted files, which was the whole point of the court order. PHP Defendants’ Use of Anti-Forensic Software. Software allowing for the complete wiping of files was found installed on several of the computer images that were produced. In some there was evidence the software was installed immediately after a court order was entered requiring production. In these the plaintiff’s forensic expert could also show that the software, CleanMyMac, was actually used to wipe files and when, although it was not possible to know what files were destroyed. The moving party (Janie Hendrix and her company Experience Hendrix, L.L.C.) proved the use was knowing when their expert, John T. Myers, showed how the software was configured to have a pop-out and warn the user to confirm complete elimination of the file (it cannot be recovered after that). The defendants testified that they did not recall ever using it. Sure. Spoliate evidence and then cover-up, or try to. Apparently no one has been able to locate this mysterious Hector David or know where he took the iMac computer sitting on Pitsicalis desk. The first issue is whether the PHP defendants had an obligation to preserve the categories of evidence at issue. A party has an obligation to preserve evidence when it “has notice that the evidence is relevant to litigation . . . [or] should have known that the evidence may be relevant to future litigation.” Kronisch v. United States, 150 F.3d 112 , 126 (2d Cir. 1998) (internal citations omitted). That standard is easily met here. The Court further finds—and the evidence to this effect is overwhelming—that the PHP defendants repeatedly breached this duty. The breaches fall in three categories: (1) the use of cleaning software on covered computing devices, (2) the failure to disclose the existence of a seventh computing device containing potentially relevant documents, and (3) the deletion of relevant text messages. Judge Engelmayer’ then discusses the key issue of intent, the mens rea to spoliate. The Court finds that, by installing anti-cleaning software on his own computer and causing it to be installed on Schmitt’s in the face of an unambiguous and known duty to preserve potentially relevant evidence, Pitsicalis intentionally caused the destruction of such evidence. The defenses proffered by the PHP defendants are unavailing. That Schmitt personally may not have acted with the intent to deleted responsive files is beside the point. The relevant mens rea here is that of Andrew Pitsicalis, who owned PHP, for which Schmitt worked as an independent contractor, and who, despite being a repeat litigant amply on notice of his duty to preserve potentially relevant evidence, urged Schmitt to run this software to delete files. Tr. 125, 133. Also unhelpful is Pitsicalis’ [*13] explanation that, at some unspecified point, he went on “Google to search for ‘top anti-forensic software’ and went through the first 10 pages of search” without finding anything for CleanMyMac. Andrew Pitsicalis Decl. at 2-3. Regardless what Pitsicalis’ internet research may have shown, the evidence adduced at the hearing clearly established both that the CleanMyMac software had the capacity to cause the deletion (and shredding) of files, and that Pitsicalis knew this, not least because the software’s causation of such deletion was made explicit to the user each time. Pitsicalis does not offer any reason for installing and using this software on his computer, let alone for having done so without first creating an image of the full contents of the computer that would have assured preservation of the computer’s contents. Andrew Pitsicalis’ deletion of relevant text messages was also clearly intentional. By his admission, he personally and deliberately deleted, among other text messages, a series of texts concerning the marketing of “Jimi”-related products, the very subject of this lawsuit. He did so one day after the Court issued an order requiring the Purple Haze Properties defendants to: “produce to plaintiffs the forensic images of” every device, including phones, containing files that are relevant to this action. Pitsicalis did not offer any coherent defense to this misconduct. The Court finds it to have been a willful and blatant violation of the duty to preserve relevant evidence. Finally, the Court finds that the removal of a computer from Andrew Pitsicalis’ office and its transfer to a Floridian, Hector David, Jr., was an act of intentional spoliation. To be sure, the question is a closer one, if only because the contents of that computer are unknown, and so the Court cannot rule out the possibility that these contents were wholly extraneous to this litigation. The location of the computer in Pitsicalis’ office, however, suggests otherwise. Had the Court been notified of the existence of this computer, it assuredly would have ordered that the computer’s contents be searched for responsive materials. It is also noteworthy that Andrew Pitsicalis did not inform his attorney of the existence of this computer. While conceivably these circumstances, in isolation, might have been consistent with the merely reckless disposal of evidence, when this episode is viewed in the light of Pitsicalis’ other acts of willful spoliation, the Court has little difficulty finding it, too, to bespeak intentional misconduct. (1) deter parties from engaging in spoliation; (2) place the risk of an erroneous judgment on the party who wrongfully created the risk; and (3) restore the prejudiced party to the same position [they] would have been in absent the wrongful destruction of evidence by the opposing party. West, 167 F.3d at 779 . Case-dispositive sanctions, however, “should be imposed only in extreme circumstances, usually after consideration of alternative, less drastic sanctions.” Id. Second, given the resources plaintiffs again have had to expend in establishing the above-chronicled acts of non-compliance by the PHP defendants with the Court’s discovery orders, plaintiffs are entitled to an award reflecting the reasonable attorneys’ fees and costs incurred in connection with bringing and litigating the instant successful motion. The Court has carefully considered whether lesser sanctions are adequate to cure the harm caused by the disposition of these materials. The Court’s firm conclusion is that no lesser sanction than the combination of an adverse inference instruction and an order directing the prompt recompense of plaintiffs for costs reasonably incurred litigating the meritorious motions for sanctions based on spoliation would adequately remedy plaintiffs’ injury. See, e.g., Moody v. CSX Transp., Inc., 271 F. Supp. 3d 410 , 432 (W.D.N.Y. 2017) (finding adverse inference appropriate where defendants intentionally lost material evidence); Ottoson v. SMBC Leasing and Finance, Inc., 268 F. Supp. 3d 570 , 584 (S.D.N.Y. 2017) (granting an adverse inference instruction where plaintiff “has acted willfully or in bad faith” in [*15] violation of her duty to preserve certain emails); First Fin. Sec., Inc. v. Freedom Equity Grp., LLC, No. 15-CV-1893-HRL, 2016 U.S. Dist. LEXIS 140087 , [2016 BL 337069], 2016 WL 5870218 (N.D. Cal. Oct. 7, 2016) (imposing adverse inference instruction for intentional deletion of text messages and awarding plaintiffs attorneys fees incurred in bringing sanctions motions). The Court has also carefully considered whether this is the rare case in which terminating sanctions are merited, as plaintiffs have urged. See Dkt. 237. At the present time, the Court’s judgment is that such extreme sanctions are not warranted, although further acts of spoliation and/or other discovery abuses could produce a different result. The footnotes in these last paragraphs are interesting. Footnote 8 explains that “The Court defers decision on the precise formulation of the adverse inference instruction until closer to trial.” That means it could become a mandatory presumption, or merely permissive. Footnote 9 acknowledges that there may be more discovery misconduct in the works. The court noted it could still strike all defenses, if the conduct continues, and save everyone the cost of a trial. Even with just a permissive presumption, the case at this point will almost certainly be won by Janie Hendrix’ company, Experience Hendrix, L.L.C.. Experience Hendrix, LLC v. Pitsicalis. Yet another loss for Jimi’s brother, Leon, in a long list of losses. Another injunction and businesses shut-down, but for how long? The Estate and L.L.C. have won so many times before. Yet they keep coming back. Is this yet another Pyrrhic Victory in a long line of pointless litigation? How long before the next suit? Some things are just beyond Law’s reach. Purple Haze. When you are the best in the world at something, like Jimi Hendrix was at guitar playing, and when you are still famous and admired by millions fifty years after your death, there will be profiteers around. When you add sibling rivalry and family resentments to the mix, then the trouble goes from bad to worse. The greatest guitarist of all time was a Phoenix – tragic, fiery, short-lived, but beautiful and spell-binding too. Where will musical genius appear like that again? Klipsch makes some of the best speakers in the world, especially their high-end Klipschorn speaker series shown here. The Second Court of Appeals used a Klipsch in a dispute recently to sound an alarm about e-discovery abuse and how it will not be tolerated. Klipsch Group, Inc. v. ePRO E-Commerce Ltd., 880 F. 3d 620 (2d Cir, 2018). The unanimous opinion written by Circuit Judge Gerard E. Lynch upheld the lower court’s sanctions against Klipch’s adversary in the suit, ePro. The adverse inference sanction entered means that Klipsch will now almost certainly win the case. The Second Circuit also affirmed the full amount of monetary sanctions, $2,680,000. Klipsch was compensated for almost* all of the additional discovery efforts occasioned by ePRO’s misconduct. ePro was also required to immediately secure payment of the full $5 Million amount of any future judgment against them, which includes damage trebling and fees. I know that sounded great to Klipsch and their attorneys. Especially since they had a four day evidentiary hearing on their spoliation motion to get there. * Somewhat sadly for Klipsch, however, as the third footnote explained, under the lower court’s opinion all of Klipsch’s fees and costs incurred were not awarded. There was another $300,000 or so that was not included, only because Klipsch could not produce proper credentials for one of the billing attorneys. Ouch. That is extremely rare and odd. Details are so very important. The Klipsch opinion has language that will carry great weight, not only because it makes sense, but also because it is from a United States Court of Appeals panel. There are not that many appeals court opinions on sanctions or e-discovery so this is a rare and important opinion. It will certainly encourage more courts to do as the trial judge did here and sanction offending parties. It is also controlling law for all federal courts in its jurisdiction, which is Vermont, Connecticut and the all important New York. In the rest of this blog I will let the language of the Klipsch opinion speak for itself with a few of my favorites selections. Klipsch Group, Inc. v. ePRO E-Commerce Ltd., 880 F. 3d 620 (2d Cir, 2018). The first quote from Circuit Judge Gerard Lynch’s opinion lays out the background. In the course of defending against claims that it sold counterfeit products, defendant-appellant ePRO E-Commerce Limited (“ePRO”) engaged in persistent discovery misconduct: it failed to timely disclose the majority of the responsive documents in its possession, restricted a discovery vendor’s access to its electronic data, and failed to impose an adequate litigation hold even after the court directed it to do so, which omission allowed custodians of relevant electronic data to delete thousands of documents and significant quantities of data, sometimes permanently. As a result, the United States District Court for the Southern District of New York (Vernon S. Broderick, J.) concluded that ePRO had willfully engaged in spoliation. It accordingly granted in substantial part plaintiff-appellee Klipsch Group, Inc.’s (“Klipsch”) motion for discovery sanctions, including a $2.7 million monetary sanction to compensate Klipsch for its corrective discovery efforts and a corresponding asset restraint in that amount, permissive and mandatory jury instructions, and an additional $2.3 million bond to preserve Klipsch’s ability to recover damages and fees at the end of the case. . . .
We find no error in the district court’s factual findings, and we conclude that the monetary sanctions it awarded properly compensated Klipsch for the corrective discovery efforts it undertook with court permission in response to ePRO’s misconduct. In particular, we emphasize that discovery sanctions should be commensurate with the costs unnecessarily created by the sanctionable behavior. A monetary sanction in the amount of the cost of discovery efforts that appeared to be reasonable to undertake ex ante does not become impermissibly punitive simply because those efforts did not ultimately uncover more significant spoliation and fraud, or increase the likely damages in the underlying case. The district court’s orders imposing sanctions *624 are accordingly AFFIRMED in all respects. [T]he history of the case makes clear that the sanctions and fees awarded in this case were carefully limited to costs Klipsch incurred in direct response to ePRO’s misconduct. Klipsch obtained approval from the magistrate judge prior to each of its substantive efforts, and in each case, that approval was given only after ePRO had already squandered an opportunity to correct its own errors. For example, ePRO’s failure to implement a litigation hold was first discovered in March 2013, during Klipsch’s first round of depositions with ePRO employees, but ePRO was not sanctioned at that time, nor was Klipsch given carte blanche to explore ePRO’s files. Instead, ePRO was permitted to hire its own discovery expert to correct the error, which resulted in the production of substantial additional discovery. Klipsch then spent approximately $550,000 on a second round of depositions occasioned by that late production. It is evident that the district court did not detect any abusive conduct on the part of Klipsch, such as the piling on of discovery demands and investigatory initiatives in order to burden its *633 adversary with wasteful expenses, motions practice, and sanctions. ePRO does not appear to contest the reasonableness of permitting Klipsch to take those remedial depositions, nor can it plausibly assert that Klipsch would have insisted on doing so even if ePRO’s initial production had been complete or timely. And only in March 2014, after ePRO had repeatedly shown itself to be an untrustworthy participant in the discovery process, did the magistrate judge determine that Klipsch was “fully justified” in seeking to undertake an independent forensic examination. Joint App. at 1187. Because the costs for which Klipsch is being compensated were reasonably incurred in direct response to ePRO’s misconduct, we cannot conclude that the district court abused its discretion by requiring ePRO to pay monetary sanctions in that amount. The defendant ePro then tried the “proportionality card” arguing that the multi-million dollar punitive damages exceeded the amount at issue in the case. That did not work. The Second Circuit explained that is not how proportionality works in sanctions. It has no bearing to the value of the case itself, just the amount of additional reasonable costs incurred because of the unreasonable conduct to be sanctioned. One party should not be damaged by the unreasonable conduct of the other. The offended party, here Klipsch, should, in effect, be indemnified from all of the burden and expense incurred because of what the offending party did or did not do. They are the innocent party. Here is how the court put it. In sum, we see nothing in ePRO’s proportionality arguments compelling us to conclude that the district court abused its discretion by awarding full compensation for efforts that were ex ante a reasonable response to ePRO’s own evasive conduct. The proportionality that matters here is that the amount of the sanctions was plainly proportionate — indeed, it was exactly equivalent — to the costs ePRO inflicted on Klipsch in its reasonable efforts to remedy ePRO’s misconduct. The Second Court was cognizant of the issues and problems concerning electronic discovery. They had been briefed on the potential for misuses of spoliation sanctions motions. Although this was not at all present in the Klipsch, Judge Lynch address this concern near the end of the opinion. Nothing that we say in this opinion should be taken as condoning excessive and disproportionate discovery demands, countenancing the tactical use of discovery sanction motions to inflict gratuitous costs on adversaries, or derogating from the responsibility *636 of district courts to ensure that litigation proceeds in a responsible and cost-efficient manner. See Fed. R. Civ. P. 1 (directing that the Rules of Civil Procedure “should be construed, administered, and employed by the court and the parties to secure the just, speedy, and inexpensive determination of every action”) (emphasis added); Fed. R. Civ. P. 26(b)(1) (scope of discovery should be “proportional to the needs of the case, considering [inter alia] the amount in controversy”). If it turns out, as the district court has estimated, that the amount of actual damages in this case is modest in relation to the costs spent on the litigation, that would be a highly regrettable outcome. But the question before the district court, and before us, is which party should be held responsible for those costs. ePRO does not ever contend that Klipsch’s initial discovery demands were unreasonable or disproportionate to the merits of the case. Nor does it seriously argue that the magistrate judge erred in allowing Klipsch to take the steps it took to remedy ePRO’s refusal to comply with those demands. The district court reasonably concluded, after a full and fair hearing, that it was ePRO’s noncompliance with its legal obligations that occasioned the excessive costs in this case, and we find no reason why ePRO should not therefore be required to pay them. I leave you with a short video biography of Paul Klipch, a recognized audio engineer leader whom I have long admired. A discovery order in Vegas shows the importance of witness interviews and what can happen when you take a cavalier attitude towards preservation. Small v. University Medical Center, Case No. 2:13-cv-0298-APG-PAL (D.C. Nev., 9/9/18) (FLSA class action seeking unpaid wages for skipped meal breaks). The lengthy order is entitled Report and Recommendation and Final Findings of Fact and Conclusions of Law and imposes severe sanctions on the defendant. The order proves, when it comes to e-discovery at least, what happens in Vegas doesn’t stay in Vegas. The truth does and should come out, including where’s the electronic evidence. Interviews are a good way to find out what really happened. This is a long blog – 5,122 words – but it is still a lot shorter than the 123 page Short opinion, which is not short at all. I counted, it is 48,980 words. Not that I’m complaining, but it is one of the longest discovery orders I have ever read. It has many good instructional elements. Specialists should probably read and skim the whole opinion. The Short opinion also has the distinction of having taken longer to prepare than any other discovery order I have ever read – FOUR YEARS! Can you imagine any decision taking that long? I am sure there were good reasons, but still. That is a full presidential term. The FLSA suit arose from a DOL investigation that faulted the defendant employer hospital, UMC, for failing to keep “accurate records” of the time worked. UMC’s alleged records failures continued after it was sued. They failed to give timely preservation notices and failed to interview key custodians. That’s a failure of the first two legal tasks a lawyer is required to do in Electronic Discovery Best Practices (EDBP), steps two and three (step one is prepare). See EDBP.com (detail shown above right with all ten legal activities shown below); also see: Favro, Phillip, Vegas Court Spotlights the Importance of Custodian Interviews with New ESI Sources (LegalTech News 8/30/18) (further discussed below); John Patzakis, Three Key eDiscovery Preservation Lessons from Small v. University Medical Center (Next Generation eDiscovery Blog, 9/12/18). Magistrate Judge Peggy A. Leen is the learned judge who wrote the opinion in Small v. University Medical Center, Report and Recommendation and Final Findings of Fact and Conclusions of Law. The order affirms and implements most of the recommendations of the Special Master for e-Discovery appointed several years ago in this case, Daniel Garrie. The Special Master’s Report was issued four years earlier on August 18, 2014, two years after the suit was filed in July 2012. The Report was notable for characterization of defendant’s discovery misconduct as so egregious as to “shock the conscience” and make “a mockery of the orderly administration of justice.” It was a long, complicated report. The court has personally conducted a thorough review of the record prior to the special master’s appointment and the record of the proceedings conducted by the special master. The record before the court and the record developed by the special master amply supports his findings that UMC destroyed evidence by failing to identify, preserve, collect, process, and search multiple repositories of information relevant to the parties’ claims and defenses. UMC failed to preserve several different types of ESI, including an estimated 26,000 text messages and 38,000 documents from a shared drive “containing human resources, corporate compliance, employee grievance, payroll, and DOL investigation data.” The documents lost include important policy and procedure manuals regarding meal breaks and compensation. Relevant ESI on laptops, desktops and local drives were not preserved until some 18 months into the litigation. UMC also failed to comply with multiple discovery orders, leading to the plaintiffs’ motions for sanctions. 2. UMC is sanctioned in the form of an instruction to the jury that the court has found UMC failed to comply with its legal duty to preserve discoverable information, failed to comply with its discovery obligations, and failed to comply with a number of the court’s orders. The instruction will provide that these failures resulted in the loss or destruction of some ESI relevant to the parties’ claims and defenses and responsive to plaintiffs’ discovery requests, and that the jury may consider these findings with all other evidence in the case for whatever value it deems appropriate. Careful study of the long opinion shows a very practical, albeit unstated reason for Judge Leen to make this concession. It made her order much harder to appeal; some would say appeal-proof. (After you put four years into something you want it to last.) That is because near the end of the process at one of the hearings Judge Leen was able to get defendant’s own attorney to concede that an adverse inference jury instruction would be appropriate. You do not see that happen very often. But this attorney apparently saw the writing on the wall from the comments the judge was making and realized that accepting a permissive inference was the best they could hope for and certainly a lot better than default judgments for all 613 class members. Here is Judge Leen’s explanation of how this admission came about. Here we see a wise and experienced judge in action. Too bad Peggy Leen retires in 2019. Judge Leen had good reason under the law to hesitate to enter default judgments on 613 claims, effectively ending the cases except to determine the amount of damages, all without any hearing on the merits of the claims. Entry of the lesser sanction of a permissive instruction was consistent with Judge Leen’s analysis of Rule 37(b) on sanctions for violation of court orders. [T]he court cannot conclude that UMC’s multiple discovery failures and failure to comply with the court’s orders threatens to interfere with the rightful decision of this case on the merits. To summarize, the court may impose sanctions against UMC under the current version of Rule 37(e) only if it finds: (1) UMC failed to preserve ESI “that should have been preserved” in anticipation or conduct of litigation; (2) the information was lost because UMC failed to take reasonable steps to preserve it; (3) the ESI cannot be restored or replaced; and (4) the plaintiffs were prejudiced by the loss. If all of these prerequisites are met, the court may issue sanctions no greater than necessary to cure the prejudice caused by the loss. Only if the court finds UMC acted with intent to deprive may the court impose the most severe sanctions. Judge Leen then applied the law to the facts. The court has found that UMC failed to preserve ESI that should have been preserved in anticipation of litigation, and throughout the course of this litigation. The court has also found that the information was lost because UMC failed to take reasonable steps to preserve it. Thousands of text messages on UMC Blackberry devices were lost and cannot be restored. Tens of thousands of files from the Q-Drive were lost and cannot be restored prior to December 2013. . . . However, the special master’s extraordinary expertise and persistence resulted in restoration, remediation, and production of a great deal of relevant and discoverable ESI. The special master was able to direct restoration of the time tracking systems UMC failed to disclose until near the end of special master proceedings. Fortunately, Jackie Panzeri, UMC’s payroll manager who described herself as a “pack rat” that “keeps documents forever” had a lot of documents on her personal drive and several archives full of emails she did not delete or modify. She was involved in the DOL investigation from the beginning and saved both documents collected and produced to the DOL and for this case. The court is also mindful that ESI is stored in multiple locations and that modified or lost data from the seven key custodians is likely to be found in other locations. . . . Although the court finds plaintiffs have been prejudiced by the loss of data from key repositories and custodians, the loss has not threatened to interfere with the rightful decision of the case on its merits given the large volume of ESI the special master was able to ensure that UMC produced. For these reasons, the court finds that lesser sanctions are appropriate, proportional, and no greater than necessary to cure the prejudice caused by the loss of ESI uncovered by the special master. As you can see, hope springs eternal. Judge Leen’s still thinks that the now lost ESI from the seven key custodians is likely to be found in other locations. I doubt the Special Master Garrie would share the same optimism. He has already called defendant’s conduct a mockery of the orderly administration of justice. In his Report the Special Master said he has “serious doubts that UMC can complete discovery in a defensible manner going forward without increased candor to the Court and their own counsel, and more competent technical assistance.’ Well, maybe they will change. If not, and Judge Leen is wrong and the missing ESI is not found, then Judge Lee or her successor might reconsider and upgrade the sanction to a mandatory adverse inference. Special Master Garrie may yet get his way. The quotes below from Small summarize the key factual findings of defendants’ threshold errors, the ones that lead to most of the others (emphasis added), much like a domino effect. To me these are the most important errors made and you should study Judge Leen’s words here closely. The record amply supports the special master’s findings that UMC had no policy for issuing a litigation hold, and that no such hold was issued for the first eight months of this litigation until after Mr. Espinoza was deposed on April 8, 2013, and was asked about UMC’s response to plaintiff’s August 6, 2012 preservation letter. The special master accurately found that UMC executives were unaware of their preservation duties, ignored them altogether, or at best addressed them “in the hallway in passing.” . . . The special master’s finding that UMC executives failed to accept responsibility for their legal duty to preserve is amply supported in the record. UMC executives and counsel failed to communicate with and provide adequate instructions to the department heads and IT personnel of repositories containing discoverable ESI to prevent the loss or destruction of potentially relevant ESI. . . . There is no evidence in the record, and UMC does not suggest there is any, that current or former counsel gave instructions to UMC to suspend business as usual to prevent the destruction, deletion or modification of ESI responsive to plaintiffs’ discovery requests. . . . It is also undisputed that UMC’s prior and current counsel failed to conduct timely custodian interviews. Custodian interviews were not conducted until well into the special master proceedings when it became apparent they had not been done. The special master required the interviews to be conducted a second time because the initial custodian interviews conducted by counsel were inadequate. . . . There is ample support in the record that UMC executives displayed a cavalier attitude about their preservation obligations addressing them in passing, and that UMC executives repeatedly took the position in declarations and testimony that responsibility for preservation was someone else’s job. . . . The special master correctly found that current and former counsel failed to conduct timely custodian interviews to identify individuals with discoverable information and key repositories of discoverable ESI. The record in this matter is very complex and voluminous. That is why the Special Master Report and the Order by Judge Leen are so lengthy; 123 pages for the order alone. Suffice it to say, if witness interviews of key custodians been conducted when they should have, shortly after suit was filed, a great deal of relevant evidence that ultimately was lost could have been saved. The Special Master’s detailed findings make that obvious. The lost-files could have been identified and preserved unaltered. Lines of responsibility to comply with legal preservation obligations could have been clarified and enforced. Had these interviews been conducted, and the ESI found quickly, the relevant ESI could have been bulk-collected and the evidence saved from spoliation. As it is, the actions and mistakes of defendant here have severely weakened their case. That’s what can easily happen when a company has a cavalier attitude to compliance with their legal obligation to preserve potentially relevant ESI. Competence and Impartiality of the Special Master, Daniel Garrie. UMC’s Failure to Comply with the Court’s Orders to Preserve and Produce ESI. UMC’s Failure Have a Preservation Policy or Litigation Hold Policy and Failure to Timely Implement One. UMC’s Executives Failure to Accept Responsibility for Ensuring that ESI was Preserved and Failure to Notify Key Custodians and IT Staff to Preserve, and Prevent Loss, or Destruction of Relevant, Responsive ESI. UMC’s Failure to Disclose the Existence of Relevant ESI Repositories, Including Multiple Timekeeping Systems and the Q-Drive Until Late in the Special Master Proceedings. UMC Modified, Lost, Deleted and/or Destroyed ESI Responsive to Plaintiffs’ Discovery Requests. UMC’s Failure to Comply with its Legal Duty to Preserve, Failure to Put in Place a Timely Litigation Hold, Failure to Comply with Multiple Court Orders to Preserve and Produce Responsive ESI, and Loss and Destruction of Responsive ESI (1) Necessitated the Appointment of a Special Master, (2) Caused Substantial Delay of these Proceedings, and (3) Caused Plaintiffs to Incur Needless Monetary Expenses. The Special Master Correctly Concluded UMC Repeatedly Misrepresented the Completeness of its Production of Documents Produced to DOL; However, UMC Was Not Ordered to Produce Kronos Payroll Data in Spreadsheet Format. Defendants failed in their challenges to the Special Master’s findings, including the threshold challenge to Special Master Dan Garrie’s competence. Ouch! Garrie is a Senior Managing Partner of Law & Forensics. He has written numerous articles and books on law, technology and e-discovery. See eg. D. Garrie & Yoav Griver. Dispute Resolution and E-Discovery, Thomson Reuters (2nd ed. 2013). Garrie earned a Masters degree in computer science at Brandeis University before going on to law school. A challenge to his expertise was misplaced. The court has conducted a de novo review of all of the special master proceedings and finds that he was professional and courteous, if occasionally frustrated by testimony displaying a lack of appreciation of UMC’s legal duties to preserve and produce responsive ESI. He was repeatedly told by UMC executives and employees that they did not know about their duty to preserve, had not learned about their preservation obligations from counsel, did not know what a litigation hold was, and had not explored relevant repositories of information responsive to plaintiffs’ discovery requests. UMC was on notice that its timekeeping, time systems, payroll policies, and procedures were relevant to this litigation. UMC also knew it was unable to document that employees were being compensated for actual time worked. Both UMC and its former and current counsel failed to comply with UMC’s legal duty to suspend routine document retention/destruction policies to ensure the preservation of relevant documents. UMC failed to communicate the need to preserve relevant documents and ESI to employees in possession or likely to be in possession of discoverable information, or for that matter to communicate this duty even to “key players.” UMC and its counsel failed to identify, locate, and maintain information relevant to specific, predictable, and identifiable claims involved in this litigation. UMC’s current counsel blamed former counsel and their ESI consultants for the delay in producing responsive ESI. Counsel for UMC advised the court at the hearing on June 25, 2013, that the client did not have any real understanding of what MPP had done or what data had been collected. This representation turned out to be false. . . . Thus, the representation UMC’s current counsel made to the court that the client did not have any real idea of what prior counsel had done regarding ESI collection was patently false. In the light most favorable to current counsel, they did not ask the right questions of the individuals involved in the initial collection. The people involved in the process— MPP, its vendors and consultants, and the IT personnel at UMC who did the collection of ESI from 26 custodians—were simply not asked until after the special master was appointed and made the appropriate inquiries. You do not see comments like that very often. Basically the judge is saying you lied to me and I cannot trust you. Again, more conscience shocking conduct by these attorneys, well outside the norm of accepted behavior. The interviews that eventually were taken under the Special Master’s order and supervision show that critical evidence could have been saved from routine destruction, if the interviews been done at the time the suit was filed, not years later. The interviews would have ensured that preservation notices were properly given, understood and followed, and the right ESI was collected and effectively searched. See William A. Gross Construction Associates, Inc. v. American Manufacturers Mutual Insurance Co., 256 F.R.D. 134, 136 (S.D.N.Y. 2009) (custodian interviews to assist also in keyword search formulation). It is important to note that the custodian interviews in Small had to be done twice. The attorneys botched the first attempt at witness interviews. They were ordered to do it again. I am not surprised. Many people underestimate the complexity and sophistication of interviews in cases like this. They also underestimate the wiliness of custodians and tendency of some of them to evade questions. It is very difficult for most attorneys to conduct an interview on the subject of information storage, IT systems, company document storage systems, email, texts, other personal messaging, social media, personal computers, phones, other devices and software programs used. Questions on these subjects are very different from questions on the merits of a case. A good custodian interview requires special technical knowledge and skills, which, unfortunately, most lawyers still lack. Too bad, because witness interviews are so very important to big cases with complex, messy ESI systems. Fulsome custodian interviews are essential for ensuring that relevant electronically stored information (ESI) is preserved. Such interviews are characterized by exhaustive questioning on any number of topics including traditional and newer sources of ESI. Properly conducted, custodian interviews should provide counsel with a thorough understanding of the nature and types of relevant information at issue in the litigation, together with the sources where that information is located. If custodian interviews are neglected or deficient, parties are vulnerable to data loss and court sanctions. The Small v. University Medical Center case is instructive on these issues. Vegas Court Spotlights the Importance of Custodian Interviews with New ESI Sources (LegalTech News 8/30/18). [The custodian] did not use those applications himself and therefore had no obligation to disclose these systems in custodian interviews ordered by the special master because a “custodian interview is aimed at uncovering the applications, systems, programs, data with which the actual custodian interfaces.” (emphasis added). In Small they never did any custodian interviews until after the case blew up and a Special Master was appointed. Even when interviews were finally conducted by defense counsel, they did a poor job; they were not well-informed of the client IT systems and were not “tough enough” with the interviewees. They seemed to be easily deceived and accepted evasive, incomplete answers. You must cross-examine and be the devils advocate for effective interviews, especially when the custodian is evasive. Interviews should go beyond cursory questioning and focus instead on identifying all sources of relevant information. Nor should they be limited to safe topics like “where can relevant messages be found in your email account” or “where are relevant documents stored on your laptop.” Interviews should now include questions regarding the existence of information exchanged through new communications media or stored in online locations . . . There is an art to interviews like this. The witnesses have to be comfortable telling you the truth, the full truth, without fear of reprisals. Assurances of confidentiality and witness protection can be a good tongue loosener, but do not mislead them. Remind them who you represent, typically at the very beginning. Trust, friendliness and rapport are important in interviews, but fear has its place too. I like to tell the witness up front how important it is for them to be fully truthful and candid. A short, but stern formal reminder can go a long way if delivered properly. Since interviews are usually not under oath this is especially important. Some formality is important as part of the tongue-loosening process. Moreover, interviews like this are typically done one-on-one with no court reporter and no written statement for the witness to read and sign at the end. An interview is just two people talking, one asking all of the questions, preferably face-to-face and preferably in the witnesses office with their computer equipment at the ready to show you something, if need be. To encourage full honesty and to help get at the truth I also sometimes inform a witness that they will likely be deposed and subject to intense cross-exam by opposing counsel. (I might possibly exaggerate the adversaries capabilities from time to time.) I point out how it will all be under oath and penalty of perjury. Then I start my role of the devils advocate, saying these are the kind of questions you will be asked, and then tear into them and make sure the story is straight and the memory not too patchy. Hey, do not get mad at me for pressing on you; these are the kind of questions you can expect and we have to be prepared. That works. Fear can be a powerful motivator of truth. So can good cross-exam. The carrot and stick approach is usually effective. Another important guardian of truth is for the questioning attorneys to be able to look the witness in the eye and follow exactly what they are saying; full technical understanding of the ESI questions. Do not speak the language? Too technical? Then bring a translator, an expert. Do not allow the witness to speak over your head. They may well be bs-ing you. Nodding your head at everything said, even when you do not understand, is a natural lawyer tendency that you must fight against. Do not be afraid to ask stupid questions. When it comes to technical interviews of any kind I interrupt and ask questions all of the time. Much of the language used in tech and e-discovery is vague and subject to multiple meanings. You need to ask questions. Only a fool is afraid to ask questions for fear of seeming foolish. Good interviews are a best practice to start e-discovery off right and protect clients from wasted expense and unnecessary risks. See the fine article on point by Kelly Twigger, 5 Things A Great Custodian Interview Can Do For Your Case And Your Budget (Above The Law, 6/27/17). Proper custodian interviews require skill and training. They require the attorney or paralegal doing the interview to have a basic understanding of technology, communications software and social media. It can be challenging in some situations and even advanced practitioners need a good detailed outline to do it right. Make sure your law firm or law department has a good ESI custodian interview outline. I suggest having both a short and long form. These help even experienced lawyers to make sure they do not forget to ask something. Expert consultants like Kelly Twigger of ESI Attorneys can help you to prepare good outlines and other tools. They can also do the most challenging tasks for you, such as prepare custom Preservation Notices, conduct Custodian Interviews, supervise ESI Collection, attend the 26(f) conference and prepare an ESI discovery plan, and ultimately, document search, review and production. An e-discovery expert can make it far easier and less expensive to stay current with the many technical-legal issues in the field. Small shows what can happen when you take a cavalier attitude towards ESI preservation and interviews. Small v. University Medical Center, Case No. 2:13-cv-0298-APG-PAL, Report and Recommendation and Final Findings of Fact and Conclusions of Law dated August 9, 2018. Preservation errors at the beginning of a case can easily cascade into serious negligence and ESI destruction. This often results in sanctions motions and discovery about discovery. That diverts everyone from the merits of the case. In Small the sanctions not only included a permissive inference jury instruction, but also monetary sanctions, amount yet to be determined. What happened to the defendant in federal court in Vegas in Small is something that you should fear and loathe ever happening to you. Proper timely custodian interviews could have prevented the loss of data in Small, could have prevented any sanctions. We all know that what happens in Vegas does not stay in Vegas, at least not when discovery in a law suit is concerned. The truth will come out as it should. This is especially true in a case like Small with misconduct that shocks the conscience in a mockery of justice, as Special Master Dan Garrie put it back in 2014. Early custodian Interviews are an important, well-accepted best-practice, especially in a large matter like Small v. UMC. Interviews are the third step in the ten-step best practices of Electronic Discovery shown below. 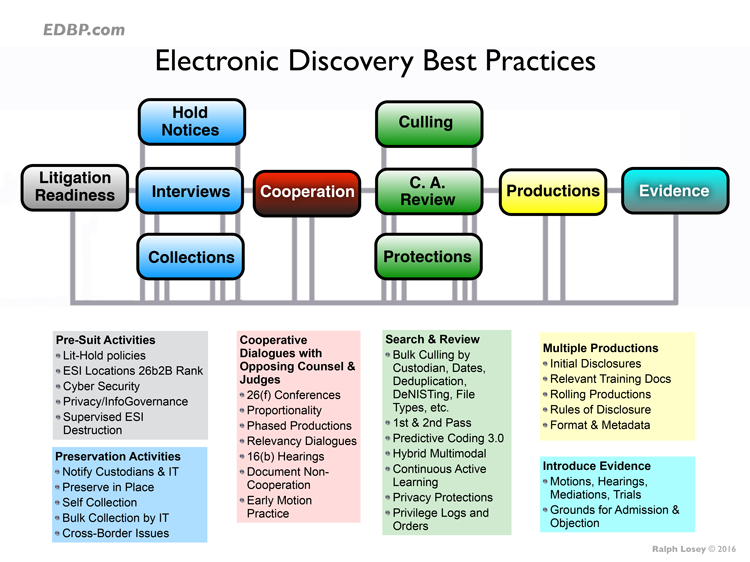 Electronic Discovery Best Practices (EDBP.com). They are one of three important activities that attorneys must perform in every law suit to preserve potential electronic evidence (shown in blue in the diagram below): hold notices, interviews and ESI collections. In a large firm like mine, which only does Labor and Employment law, you can use one of the specialists in e-discovery to assist in these tasks, at least until you become proficient on your own. Specialists in large firms are usually experienced attorneys that now limit their work to e-discovery. (I recommend against specializing too early, but some are able to do it effectively.) In my firm there is only one full-time specialist, me, but I have over fifty attorney liaisons to assist. They have special training in e-discovery and are the go-to e-discovery lawyers for their office (we have 50), but they spend most of their time in employment litigation and other services outside of e-discovery. Other large firms have more full-time e-discovery specialists, but fewer part-time specialists. I decided to try to spread out the knowledge. One of the things a specialists do, full or part-time, is help to create and update good standard witness interview question outlines for use by other attorneys in the firm. For instance, I have both a long and short form that I recently updated. Your firm probably has something similar. If not, do it now. Better late than never. If you are in a smaller firm and do not have a full-time specialist in your ranks, then you should consider retaining an outside specialist as co-counsel in larger e-discovery matters. They can help you to save on overall costs and, most importantly, prevent a disaster like Small v. University Medical Center from ever darkening your door. If you are a data hoarder, an information pack-rat that saves everything, you will eventually drown in your own data and die. Maybe not literally killed, mind you, but figuratively. Maybe not you personally, but your enterprise, your group, your project, your network. Too much information can render you and your enterprise intellectually paralyzed, cut off and seriously misinformed or uninformed. Saving it all is physically and logistically difficult, if not possible. Even if you could, keeping it all would impede your search, making it hard to find the information you need, when you need it. I address these issues this week in my review of a new commentary by The Sedona Conference Principles and Commentary on Defensible Disposition (August 2018). I nformation overload is better than physical death I know, but still very bad in today’s Google world. You end up not being able to find the information you need, when you need it. That makes it hard to determine what really happened. It allows lies and liars to fester and grow. We are now seeing firsthand in the U.S. where this can lead. It is not good. It has put the whole world into a precarious situation. We need the truth to thrive as a culture; not smoke and mirrors, not conman games. A culture built on lies is a cancer. It is a deadly disease, especially for the Law, which depends on truth, on evidence, on real facts, to attain the goal of Justice. Over-retention is the enemy of effective, efficient search. The more ESI there is to search, the more difficult the search. There can be exceptions to this rule, but for the most part it is true. That makes a “save everything” ESI policy an enemy of search. It interferes with the ability to find the information needed, which in my case is electronic evidence in legal proceedings, when it is needed. It is important for these information needs be filled quickly and completely. Search is powerful. That is my field. The more data the better, is often true, but not always. It depends on the data and its effective life, how long a particular type of data is of any use to anyone. Big data allows for detection of patterns that would otherwise not be seen. This analysis takes CPU power. The advances in this area have been fantastic. We have the processing power, as well as the cheap storage, but our search and retrieval software has not otherwise kept up with the data explosion in volume and complexity. Predictive coding software and other AI applications have come a long way, but are still sometimes confused by the volume, variety and complexity of useless data that plagues most company IT systems. Retrieval of specific documents and metadata takes time and specialized human skills. The more worthless data in a collection, such as spam, the greater the number false positives in a search, no matter how powerful the algorithms or skilled the searcher. Vast volumes of data make searches longer to execute and less precise. The more noise in the data, the more difficult to hear the signal. That is a fundamental law of information. With high data volumes you can often still find the signal, the relevant documents that you need in large chaotic data collections, but it takes time and special tools and skills. There are often too many false positives in searches of data collections containing too much spam-like, useless data. Although search is strong, search alone is inadequate to meet the needs of most organizations. They also need data destruction and retention policies that govern all information. That is one reason why the success of information governance depends on data disposition. An organization should save as much as it needs, but not too much, and also not too little. It is a Goldilocks situation. If you do not save data, you can never find it. If you save too little, then what you later need might not be there to be found. But if you save too much, you may never be able to find what you need. The signal may be in the collection to be found, in plain view, but hidden in the vast numbers, the noise of spam and other irrelevancies. I have debated Information Governance leaders for years the importance of search versus file destruction. I was pretty much the only advocate for search over disposition. I favored retention over destruction in most close cases, but I had a cost and proportionality overlay. I am reminded, for instance, of my debate with Jason Baron on the subject at the IQPC 10th Anniversary of Information Governance and eDiscovery, where he managed to quote Churchill at the end and won the debate hands-down. e-Disco News, Knowledge and Humor: What’s Happening Today and Likely to Happen Tomorrow (e-Discovery Team, June 7, 2015); Information Governance v Search: The Battle Lines Are Redrawn (e-Discovery Team, Feb. 8, 2015). I did not consider it a fair debate because of Jason’s very successful pandering to the jury during his closing argument with a quote by Churchill from his speech, We Shall Fight on the Beaches. That’s the one about never surrendering in the fight against “the odious apparatus of Nazi rule” (sadly, this exhortation still has legs today in the US). The debate was “unfair” primarily because this was an IG conference. Everybody in IG is pro-destruction and values disposition over search. I think most IG leaders go too far, that they are trigger happy to kill data. I pointed out in my debates that once a file is deleted, it cannot be found, no matter how good your filing, no matter how good your search (forensic recovery issues aside). I am pro-search and think that the importance of management of ESI by filing and disposition is somewhat overblown. I think search is king, not data deletion. Still, even in my most strident of debates and pro-search arguments, I never advocated for the retention of all data. I always assumed that some file disposition was required and accepted that as a given. I was not a save everything and search advocate. I advocated for both, search and destroy. I advocated for more retention than most, but have never argued to retain everything. There is a common core of agreement that some ESI should be deleted, that all data should not be saved. The disagreement is on how much data to save. How does a person or company know what is the “just right” data destruction policy for that company? There is agreement among experts that there is no one-size-fits-all solution, so custom work is required. Different retention and destruction policies should apply depending on the company and the particularities of their data universe. Many IG specialists advise clients on the custom fit they need. It involves careful investigation of the company, its data and activities, including law suits and other investigations. These IG specialists, and the companies they serve, now have an excellent new resource tool to analyze and custom-fit data destruction policies. The Sedona Conference Principles and Commentary on Defensible Disposition (August 2018 Public Comment Version) (Editors-in-Chief, Kevin F. Brady and Dean Kuckelman). I highly recommend this new and excellent work by The Sedona Conferences. My commendations to the Drafting Team: Lauren A. Allen, Jesse Murray, Ross Gotler, Ken Prine, Logan J. Herlinger, David C. Shonka, Mark Kindy; the Drafting Team Leaders: Tara Emory and Becca Rausch; the Staff Editor: Susan McClaim, and Editors-in-Chief, Kevin F. Brady and Dean Kuckelman. Please send to them any comments you may have. The Commentary begins in usual Sedona fashion by articulation of basic principles and comments tied to principles. The cases and legal authorities cited in all Commentaries by The Sedona Conference are excellent. This commentary on data disposition is no exception. I commend it for your detailed study and reference. Free download here from The Sedona Conference. PRINCIPLE 1. Absent a legal retention or preservation obligation, organizations may dispose of their information. Comment 1.a. An organization should, in the ordinary course of business, properly dispose of information that it does not need. Comment 1.b. When designing and implementing an information disposition program, organizations should consider the obligation to preserve information that is relevant to the claims and defenses and proportional to the needs of any pending or anticipated litigation. Comment 1.c. When designing and implementing an information disposition program, organizations should consider the obligation to preserve information that is relevant to the subject matter of government inquiries or investigations that are pending or threatened against the organization. Comment 1.d. When designing and implementing an information disposition program, organizations should consider applicable statutory and regulatory obligations to retain information. PRINCIPLE 2. When designing and implementing an information disposition program, organizations should identify and manage the risks of over-retention. Comment 2.a. Information has a lifecycle, including a time when disposal is beneficial. Comment 2.b. To determine the “right” time for disposal, risks and costs of retention and disposal should be evaluated. PRINCIPLE 3. Disposition should be based on Information Governance policies that reflect and harmonize with an organization’s information, technological capabilities, and objectives. Comment 3.a. To create effective information disposition policies, organizations should establish core components of an Information Governance program, which should reflect what information it has, when it can be disposed of, how it is stored, and who owns it. Comment 3.b. An organization should understand its technological capabilities and define its information objectives in the context of those capabilities. The effective, timely, and consistent disposal of physical and electronic information that no longer needs to be retained should be a core component of any Information Governance program. The Sedona Conference, Commentary on Information Governance, 15 SEDONA CONF. J. 125, 146 (2014) (“Information Governance” is “an organization’s coordinated, interdisciplinary approach to satisfying information compliance requirements and managing information risks while optimizing information value.” Id. at 126). It is a sound strategic objective of a corporate organization to dispose of information no longer required for compliance, legal hold purposes, or in the ordinary course of business. If there is no legal retention obligation, information should be disposed as soon as the cost and risk of retaining the information is outweighed by the likely business value of retaining the information. . . . Typically, the business value decreases and the cost and risk increase as information ages. Id. at 147.
actions if they later become involved in litigation. Indeed, the phrase “defensible disposition” suggests that organizations have a duty to defend their information disposition actions. While it is true that organizations must make “reasonable and good faith efforts to retain information that is relevant to claims or defenses,” that duty to preserve information is not triggered until there is a “reasonably anticipated or pending litigation” or other legal demands for records. The Sedona Principles, Third Edition: Best Practices, Recommendations & Principles for Addressing Electronic Document Production, 19 SEDONA CONF. J. 1, 51, Principle 5, 93 (2018). Another factor in the struggle toward effective disposition of information is the difficulty in appreciating how such disposition reduces costs and risks. Lastly, many organizations struggle with how to design and implement effective disposition as part of their overall Information Governance program. The Principles and Commentary on Defensible Disposition attempt to address these three factors and provide guidance to organizations, and the professionals who counsel organizations, on developing and implementing an effective disposition program. The Sedona Conference Principles and Commentary on Defensible Disposition (August, 2018) concludes by identifying the main challenges to data deletion. There are more, I am sure, but this is a good top ten list to start. I only wish they had included more discussion of these top ten. Search is still more important for me than destroy. I prefer Where’s Waldo over Kill Waldo! I have not changed my position on that. But neither has mainstream Information Governance. They still disagree with my emphasis on Search. But everyone agrees that we should do both: Search and Destroy. Even I do not want companies to save all of their data. Some data should be destroyed. I agree with mainstream IG that saving everything forever is not a viable information governance policy, no matter how many resources you also put into ESI search and retrieval. I have never said that you should rely solely on search, just that you should give Search more importance and, when in doubt, that you should save more documents than less. The Search and Destroy argument has always been one of a matter of degree and balance, not whether there should be no destruction at all. The difficult questions involve what should be saved and for how long, which are traditional information management problems. Where to draw the line on destruction is the big question for everyone. The answer is always company specific, even project specific. It involves questions of varying retention times, files type and custodian analysis. When it comes down to specific decisions, and close questions, I generally favor retention. What may appear to be useless today, may prove to be relevant evidence tomorrow. I hate not being able to prove my case because all of the documents have already been deleted. Then it is just one person’s word against another. IG experts, who usually no longer litigate, or never litigated, do not like my complaints. They are eager to kill, to purge and destroy data. I am more inclined to save and search, but not save too much. It is a question of balance. Data destruction – the killing of data – can, if done properly, make the search for relevant content much easier. Some disposition of obviously irrelevant, spam and otherwise useless information makes sense on every level. It helps all users of the IT system. It also helps with legal compliance. Too much destruction of data, too aggressive, and you may end up deleting information that you were required by law to keep. You could lose a law suit because of one mistake in a data disposition decision. Where do you draw the line between save and delete? What is the scope of a preservation duty? What files types should be retained? What retention times should apply? How much is too much? Not enough? The questions go on and on and there is no one right answer. It all depends on the facts and circumstances of the organization and its data. The new Sedona Conference Principles and Commentary on Defensible Disposition is an important new guide to help IT lawyers and technologists to craft custom answers to these questions.